Teams in China are facing a ban after failing to pay players wages and bonuses. According to the BBC, the Chinese Super League has 13 teams facing a ban on next year’s competition due to unpaid wages, debts and other financial matters. The football clubs of China have been spending money with little regard over the last 24 months. Clubs have paid excessive transfer fees for Premier League flops and have offered large wage packets to ageing players like Carlos Tevez. The Argentine is on a reported £615,000-a-week salary, but the Mirror reports he is unaffected by the wage dispute. 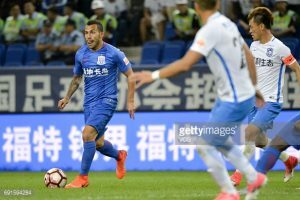 His club, Shanghai Shenhua, are one of the 13 CSL clubs facing expulsion next season. The amount of money being used to sign players has raised many questions in Europe, North America and South America on whether it is sustainable. Rumours of the Chinese government fuelling the player signing spree have been high, but it now looks as though teams have reached their limit on spending. The Chinese Football Association has explained that 13 CSL clubs have “outstanding debts on player transfers, salaries or bonuses” that must be paid, according to the BBC. The CFA is not only preparing to ban teams over the unpaid finances, but the association has instituted a new “100% tax” on the league’s clubs. The tax will only affect the clubs who make losses, and the tax will double any transfer fee paid for a foreign player. The idea is two-fold, it will prevent clubs from overspending and it will encourage teams to sign local talent. In recent years, China has been attempting to ignite football interest in its citizens in hopes of becoming a world power in the sport. Billions of dollars have been spent to design, build and equip world-class training facilities for young players. Coaches from all over the world have been attracted to the country and school programs have been developed to produce China’s football future. The purchasing of high-priced foreign stars has been another way to increase the interest and participation of Chinese people in the sport. Despite the growing interest, teams are still overspending, and leaving players without wages paid.